Christopher Reeve studied drama under John Houseman at the prestigious Juilliard School of Performing Arts, where his roommate was a young Robin Williams. He played Ben Harper on the long-running soap opera Love of Life from 1974-76, then quit Juilliard to star opposite Katharine Hepburn in a Broadway play, A Matter of Gravity. Then came Superman (1978). Reeve played a paralyzed man in Above Suspicion (1995), the last film he made before being paralyzed in a horse-riding accident. Reeve always insisted he would walk again, but at his best he was able to breathe for several hours at a time without a ventilator. 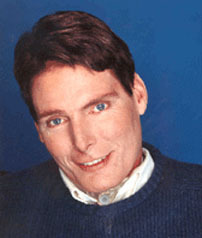 After his accident, Reeve became an activist, chairing the Christopher Reeve Paralysis Foundation and running the Christopher and Dana Reeve Paralysis Resource Center. He criticized the Catholic church and President Bush for blocking embryonic stem-cell research that could help paralyzed people recover. He also guested on the 'Superboy' series Smallville, and starred in a so-so remake of Hitchcock's Rear Window. Reeve died from a severe systemic infection caused by a pressure wound, an ailment typical of paralytics. The infection put him into a coma on 9 October 2004, causing his death at his New York City residence the following day. Hollywood Walk of Fame 15-Apr-1997 at 7021 Hollywood Blvd.